What’s New this Week? Our 5 top pet and animal topics and a few more! 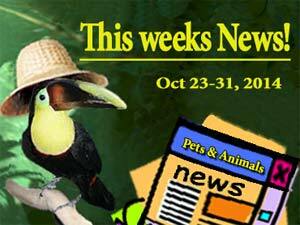 The latest web chatter going around in the animal world spans hundreds of articles and blogs! To help you stay up to date with what’s happening on social media and the news, we’ve culled through all this week’s web chatter, October 24th-31st, 2014. We narrowed down the selections to the choicest topics, and then pulled out the very best. The choicest, top 5 news items that caught our attention are followed with a few more choice selections: cute, cool, unbelievable, smart, inspirational… and a few dumb! These awesome 360-degree coral reef videos are being created by Google maps in conjunction with Catlin Seaview Survey, and are just awesome. Young girls dressed as hamsters brings out the best in Halloween, it just doesn’t get any more adorable than this. Three darling newborn lion cubs! Born at the Woodland Park Zoo in Seattle, Washington, their birthday was Friday, October 24th, so these triplets are just one week old! Frans gives voice to the animal kingdom. Watching and photographing animals inspires a philosophy that all creatures, animals and people, are one! These snippets from his 2014 TED talk say it all. Looking for the secret to romance? Start in the horse world. Watch And Learn – The Best Way To Propose To A Horse Woman! What could be more darling than a parrot costume for little ones! A puppy or a hamster! Belle is a very, very tiny Yorkie. This darling little pup is only the size of a hamster! This 8-week-old puppy is only the size of a hamster! Just how intelligent is your dog? Take a fun quiz to figure out your dog’s smarts! Quiz: how intelligent is your dog? You’ve probably have heard about the Pacific Ocean’s “Garbage Island.” Here’s a helping hand removing tons of ocean debris. Lovely Purple Finches are staying in the northern forests of Canada for the winter, because food is plenty! These beauties only head south for easy pickings when food is scarce! Pet alligators need rescuing too! These are some of the “most misunderstood exotic animals… that only serious professionals or extremely experienced hobbyists should even consider owning.” But they keep showing up at sanctuaries and rescues. More girl babies when it’s warm? This is often true in the animal world, and in Japan… they think it’s true for people too! This python gave birth as a virgin… never before been seen with this species. Purebred dog, “pure” mutt, or cross-breed… which is best? This guide may you decide. Purebred vs. Mutt: Which Is Best for You? What critters scare you most? It’s Halloween, what better time to conduct a poll of the most frightful creatures! Some quick Halloween tips to keep your pets safe tonight. Wow… some ocean corals actually like to get along! What can we learn from that? New idea about climate change… and it’s positive! Horses are good for more than therapy, they’re good for business! Leave it to the internet to come up with all sorts of strange new viral trends. What started with a tweet has gone a bit crazy! Putting bottoms on horses, diapers and now pants? This seems to be a new theme going around! Jimmy Kimmel Pitches Horse Pants On ‘Shark Tank,’ But Will The Sharks Say Neigh? Is this weird… or just a weird journalism? In Pennsylvania a current Fishing License is required to search for reptiles and amphibians. Law enforcement says “it is unlawful to sell, barter or trade native species or their parts such as turtle shells,” but apparently they collected, and even killed. The workload must be mighty slim for these city council folks. Guess they have to come up with something to legislate in order to earn their keep… so they don’t get voted out. Clarice Brough is a team member at Animal-World.com and has contributed many articles and write-ups. Dove or Pigeon, what the heck are you?